Monnow Man | Food, mostly. This blog is in hiatus while it decides what its purpose in life is. 21 Plus, a Monmouthshire charity I’m involved with is holding a ceilidh in June. on Saturday, 14 June 2014 from 5 – 9 pm. It will again take place at Dingestow Village Hall in Dingestow, Monmouthshire. 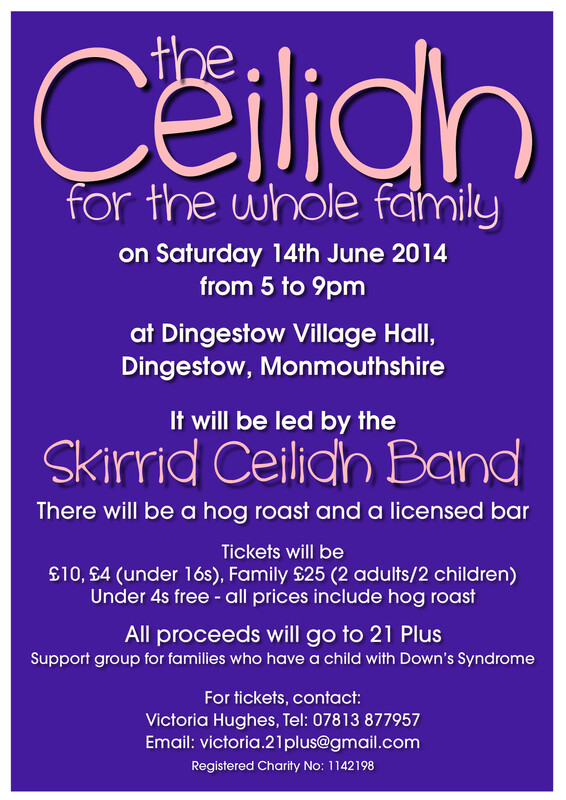 There will be a hog roast and the Skirrid Ceilidh Band will be leading the dancing. We will have a licensed bar, sell cakes and hold a raffle. Tickets are £10 for adults, £4 for children (under 16) and £25 for a family (2 adults and 2 children). The ticket price includes the hog roast. All proceeds will go to 21 Plus (the local support group for families who have a child with Down’s Syndrome). Please come along, bring your families, relatives, friends, colleagues and neighbours and pass on this invitation!